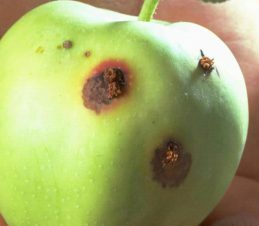 Damage is caused by feeding of the larvae in fruit. There are two types of damage: deep entries and stings. Both types of damage spoil the fruit. The larvae penetrate into the fruit and tunnel to the core where they feed on the seeds. 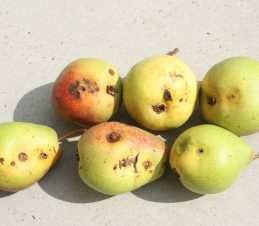 This leaves holes in the fruit that are filled with reddish-brown, crumbly droppings and chewed up fruit called frass. The frass builds up in the tunnel and can protrude out of the entry hole. Cutting open fruit infested with codling moth reveals the tunnel created by the burrowing larva. However, if it is a new entry, the larva will be quite small and can be difficult to see. Generally, the beginnings of a feeding tunnel, along with some amount of frass buildup, can still be seen. Once the larva has matured it will exit the fruit. 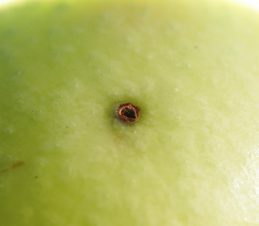 The entry holes may be present on the calyx end of the fruit, making it more difficult to spot. 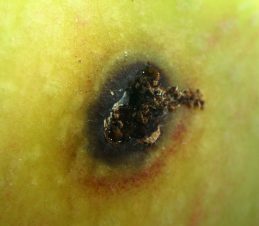 Exit holes in infested fruit will be evident as the larvae is much larger after feeding. 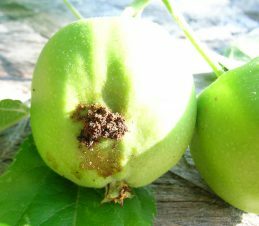 Deep entries are a problem in stored fruit because bacteria and fungi in them lead to fruit rot. Stings are shallow entries where the larvae died or gave up and tried another place.